Apple really stick it to Google by supplanting Google Maps in iOS 6 with in-house mapping service, didn’t it? But more than anything, yesterday’s WWDC keynote has proven that Apple is just as merciless without Steve Jobs. As both tech giants fight tooth and nail for mindshare, Cupertino is now adamant to go thermonuclear on everything Google, not just Maps. The iPhone maker demonstrated its incredible agility and willingness to fight Google on multiple dimensions yesterday. To that extent, iOS 6 could be viewed as the biggest step yet in the de-Googlification of iOS. 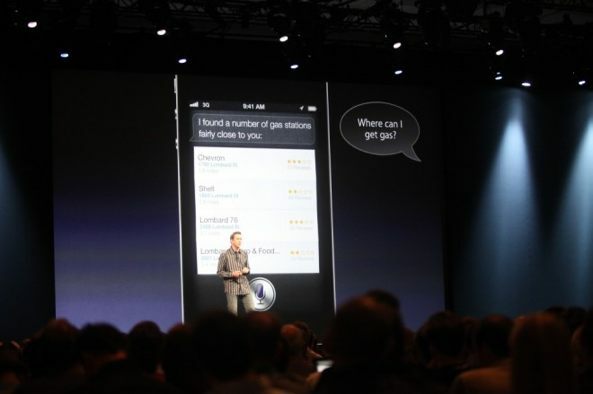 The keynote kicked off with a Siri gimmick. She made fun of Google’s Android code-names, saying they must have been created by “Ben and Jerry”. By the way, she also likened Samsung’s new phone to a refrigerator. Here’s a clip of that gag. 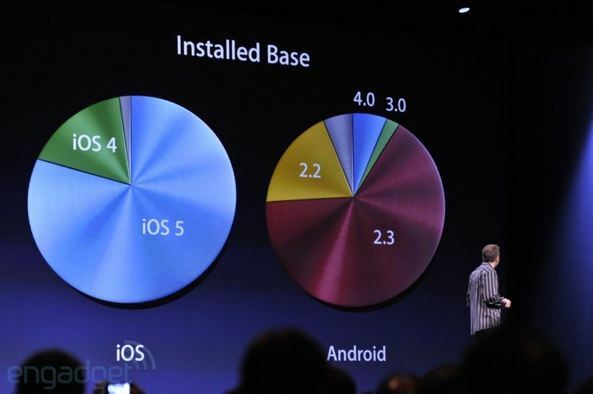 And in another shot at Google, iOS boss Scott Forstall brought up a slide highlighting Android’s fragmentation problem. 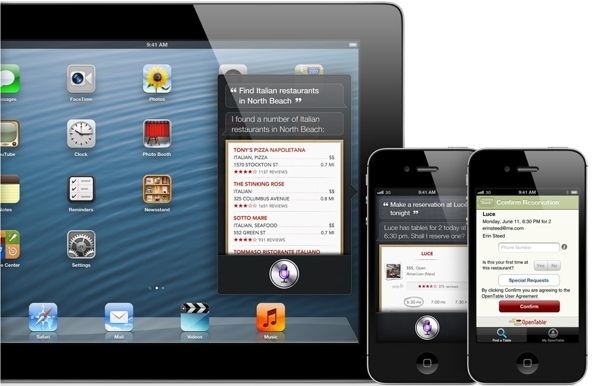 More than 80 percent of our customers are running the latest version of iOS, iOS 5. Now if you compare that to the competition, they released a dairy product, 4.0, about the same time that we released iOS 5. And about 7 percent of Android customers are running the latest version. Put in another way, by the time the iPhone 5 surfaces this fall, four generations of iPhones will be running the most up-to-date software. Android chief Andy Rubin tweeted two days ago that Google is now seeing an astounding 900,000 daily activations, but from the ecosystem point of view Android seems to be spiraling out of Google’s control. Google’s I/O event runs June 27-29 so it’ll be interesting hearing how it spins the fact that iOS is consistently developers’ platform of choice. And of course, with Maps sporting Siri integration, Apple is looking to nuke Google Maps out of orbit in a big way. Apple Maps tap Siri on many levels. 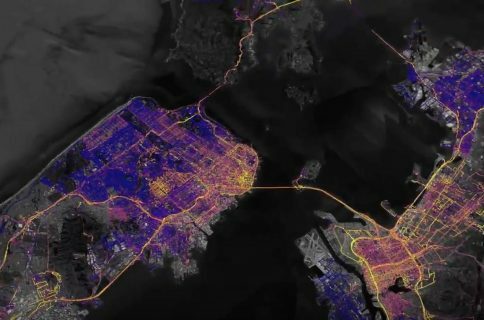 Apple also partnered with fifteen providers on Maps, reportedly using Microsoft’s Bing Maps data as well. And in my opinion, Google’s hastily organized presser only underscored its anxiety over Apple entering the mapping space. While Apple is unlikely to take a shot at creating a search engine (at least not for now), it’s been de-emphasizing search on mobile in favor of native apps. With Maps, Apple has forced its way into the business of local search, a market very important for Google. And with app banners in Safari, whenever you visit a website that has a native app, you’ll be subtly enticed to use these instead of the web version laden with Google ads. Well, iOS 6 adds Facebook integration to its social sharing arsenal, but not the Google+ thing. Both Facebook and Twitter run more than skin deep, they’re tightly integrated into the bowels of the operating system, letting you tweet and post stuff from apps, Notification Center and even Apple’s content stores. 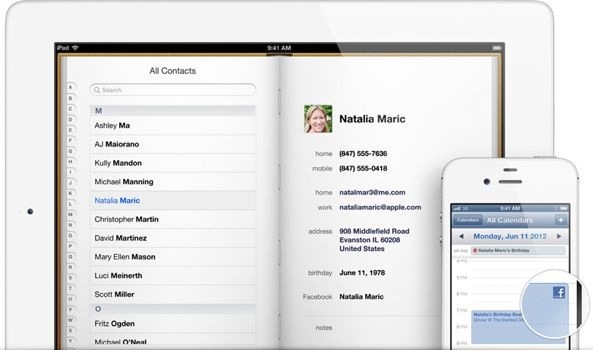 Facebook integration in iOS 6 automatically updates your Contacts and Calendar data. Though Apple would be foolish to ignore the nearly one billion Facebook users, it’s hard to escape the notion that the Facebook deal proves the old adage “the enemy of my enemy is my friend”. And a really crucial differentiator: Apple’s new Passbook app that seeks to organize all your coupons, credit card information, boarding passes, shopping deals and more in one place. It ain’t a digital wallet per se, but certainly paves the way for the iPhone becoming your e-wallet in the not-so-distant future. It’s got some nice touches, too. For example, being time and location-enabled, all your passes and tickets appear on the lock screen when and where you need them. 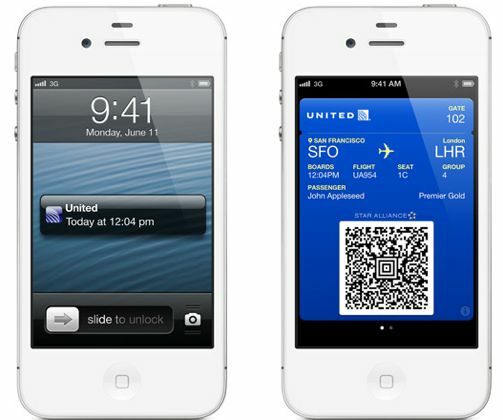 Apple’s new Passbook app is the first step to making your iPhone your e-wallet. Passbook takes a radically different approach to Google’s iWallet service that requires a smartphone with an NFC chip, a special point of sale terminal and only works on the Sprint network in the United States and in partner stores. In fact, Sprint announced plans to pursue its own digital wallet service, leaving Google Wallet kinda lingering out there. And of course, Apple’s flawed and unreliable digital assistant Siri rendered Android’s Voice Actions outdated (Google is working on a similar AI-driven feature). 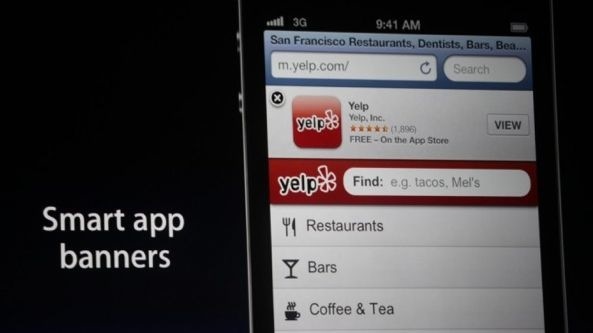 New deals Apple cut with Yelp and others mean you can now find a restaurant and make a reservation through the Siri interface, bypassing Google search altogether. New Siri features let you accomplish even more without visiting the traditional web. 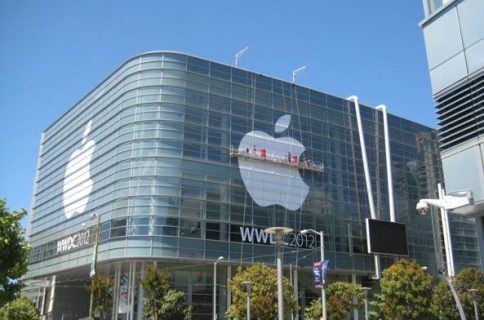 Granted, Apple’s WWDC keynote took the concept of pot shots beyond our comfort level. And there is no reason why the WWDC keynote stream would initially work only in Safari and not in Google’s Chrome, Mozilla’s Firefox and Microsoft’s Internet Explorer browsers (Apple fixed the problem later). All told, perhaps I’m just overblowing yesterday’s keynote? All I know is that Apple has in its DNA this urge to control technologies, a necessity to make tightly integrated products that “just work”. So with or without Google being a friend or a foe, Apple would have eventually moved into mapping space. But there’s no denying that by deciding to openly compete with Apple on mobile, Google only accelerated Apple’s plans to cut all ties with the Mountain View-based search Goliath. To be perfectly clear, I’m all for competition because it forces Apple to never stop innovating. Conversely, I’d love to hear your opinion. 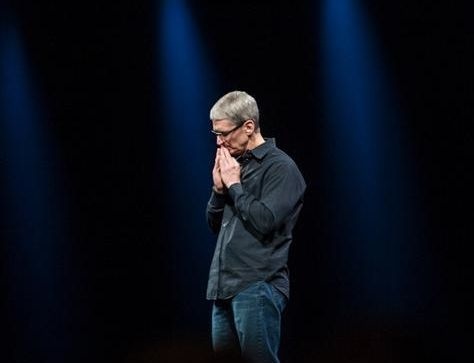 Is Apple really trying to kill Google? Will the search giant pay dearly for its intent to derail Apple in mobile?